9-Wicket Croquet: After the casual game of 9 wicket croquet what’s next? 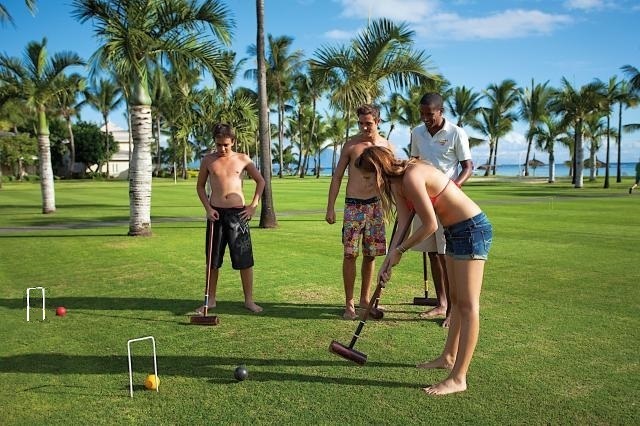 Once hooked on the game of 9 wicket croquet, you purchase a better mallet, learn the skills of making rush shots, split shots, different roll shots and now step up to becoming a serious 9 wicket croquet player. You learn the strategy of the basic game and start playing “partner ball” or Doubles teams. Most of us started out playing the “cutthroat” version of the game where it’s every man for himself using the USCA 9 wicket basic rules. When a ball goes out of bounds, in the garden or out in the street, it is brought back in 36 inches and your turn continued. If you hit a ball you were “dead” on, the balls remained where they stop with no penalty. Some players do this scatter shot intentionally to knock an opponent out of position. The basic rules are pretty forgiving. At some point, you start looking for more challenges like formal boundary lines and more involved strategies than “firing” an opponent into the woods! Here are some challenging variations to the game you should consider. (1)	On the opening turn the sequence is blue/red/black/yellow, after the opening turn a player may choose to play either ball. (2)	A ball is in the game when it is placed on the ground 36 inches in front of wicket #1 or half way between the finishing stake and wicket#1 if playing with less than the 6 foot separation of wickets and stakes in a full size court. A player’s ball is automatically alive on all other balls at the start of every turn. 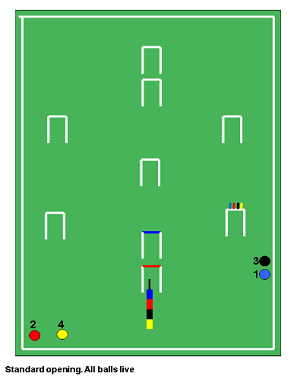 (a) If a player hits a ball they are dead on within the same turn, the turn is over and all balls are returned to the original positions. (b) A dead ball is a ball which the striker’s ball has hit before clearing its next wicket within the same turn. (3) If a player hits their ball or another ball out of bounds, the turn is over and all balls come back in perpendicular 9 inches from the boundary line. (4) A ball is out of bounds if it touches the boundary line. Green rushes orange up court to attack opponent. Photo by Jane Ussher. (5) When a player hits the turning stake, the opponent on their next turn may choose to pick up one of their balls and play it a mallet head (9 inches) from the turning stake or from the center wicket. (6) All games are timed for 1 hour with sudden stop when the clock expires and there are no extra turns. As with any new rules the more you play them the better you become. Some of us learn the strategies quicker than others. If you are playing the 9 wicket game with these Variation Options and non-sequence play, always play aggressively. In my opinion it is better to choose the blue/black balls and play first on the opening turn. On the second turn, the blue/black team has the advantage to start a run. If you are going to make a three ball break I suggest using the opponent’s ball as the pioneer ball and keep the partner balls together, otherwise if you miss a wicket your opponent will split you up. If you are using Variation Option 1, non-sequence play, the foot shot becomes an important shot to send the opponent’s ball to strategic places and far enough from your balls if your run breaks down. If your skills are good enough to run the court with two balls take your partner ball with you but be careful that your opponent does not clear its two balls at the turning stake before you can get one of your balls all around the court to become a rover ball otherwise, you could lose the game against the clock. The object of the game is to play aggressive on each turn and clear as many wickets as you can with a series of rush shots, split and rolls shots setting up in front of your wicket, clear the wicket and start the sequence again, rush/split/clear as you move around the court. If you are skilled enough and can play with just your partner’s ball go for it but remember, a three ball break is better as long as you use the opponent’s ball as the pioneer ball and keep your balls together. Below is an Example Game. In this game the blue ball has the advantage after the opening turn. The blue ball clears wickets 1 and 2 with one stroke left takes the aggressive position by going out of bounds about three feet on the east boundary line in front of wicket 3 and coming in 9 inches to wait for black. Red ball clears wickets 1 and 2 with one stroke left. If you are sure you can hit blue go for it, but if you miss you are in big trouble. If you go to the yellow flag and wait for the yellow ball it could be risky on the second turn that blue/black could use you to begin a run. Maybe you want to play safe going to the west boundary line. Know your opponent’s skills. Black clears wickets 1and 2 with one stroke left. Black has two options. It can join up with blue or depending where red is go for it. Play smart. Yellow is usually played by one of the strongest players and may have an advantage because there are three balls on the court but always remember the court conditions can be a factor for even the best of players. Of course, if any ball misses the first wicket they are in big trouble and if you can’t clear the second wicket, play safe and don’t be a target for the ball to follow. On the second turn, if the blue/black team is joined up on the east boundary line they are in a good position to start a break. If the blue/black team feels threatened by the position of the red/yellow team, they may want to separate them at this point before beginning their run. Know the skills of your opponent(s). What all players are striving to do (on each turn) is to rush a ball, with a split shot set it up on the other side of a wicket, clear the wicket and start the sequence again, rush/split/clear your wicket as you move around the court. (1)	The key to your success is your ability to assess your shooting and tactical skills as well as those of your opponent. (2)	When you have two strokes, consider making your next wicket before other options, i.e. a split shot, that if unsuccessful could cost you missing your wicket with the continuation stroke. A bird in hand is sometimes worth two in the bush. (3) Always try to keep your two balls together as you move around the court. (4) Use the boundary line to your advantage. (5) Be careful not to leave your balls in the middle of the court. (6)	Stay positive and play aggressive. Don’t play defensively unless you absolutely must.